I've recently come across CAPP's fantastic collection of data. 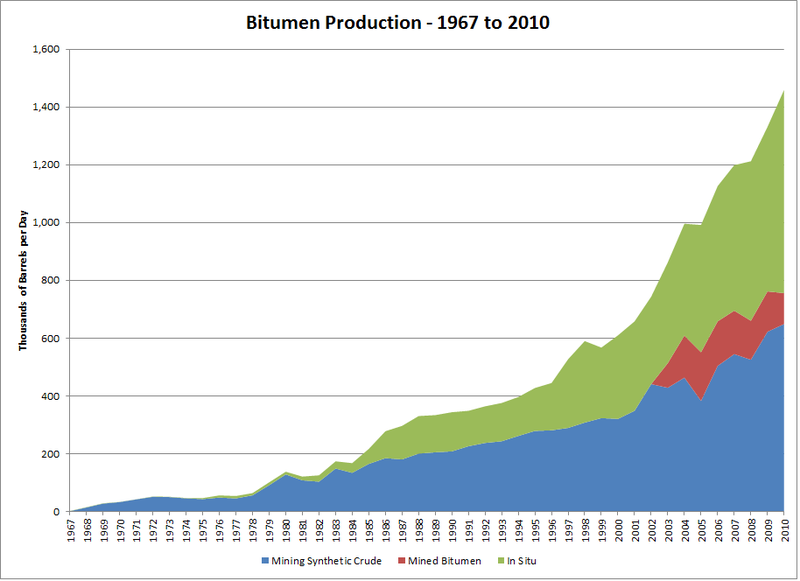 All sorts of interesting charts could be made with this but I've started with bitumen production between 1967 and 2010. Some interesting things to note: although many people consider the oil sands to be a new phenomenon, they have produced over 200 thousand barrels a day since the mid 1980s, mostly through mining at Syncrude and Suncor at the time. Speaking of mining, as of 2010 it still accounted for more production than in-situ methods, although the gap is closing rapidly - mining accounted for 756 thousand barrels per day, in-situ 703 thousand. Between 1967 and 2010 a total of 6.7 billion barrels of bitumen were produced. As a special bonus (!!) 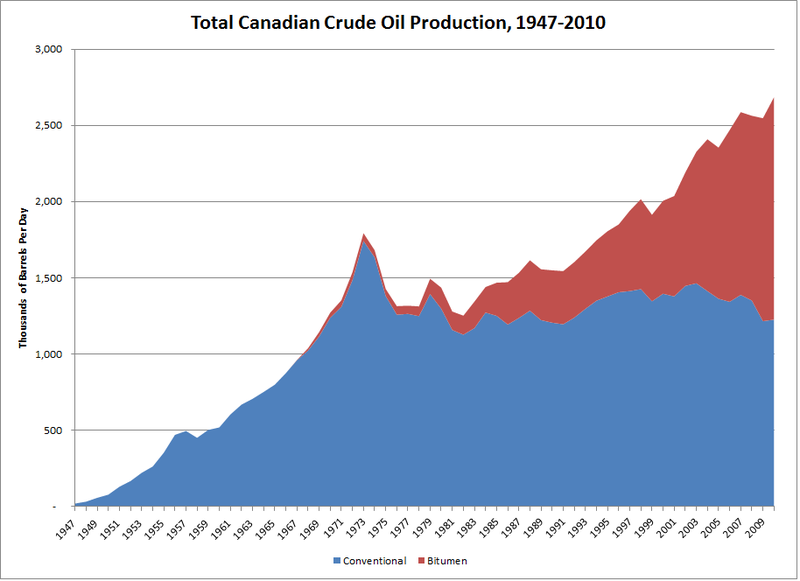 I have also made a plot of total Canadian production from conventional and bitumen sources. I think I might be double counting some of the bitumen, because the conventional data says it includes "experimental Alberta crude after 1985" which may also be in the in-situ bitumen tally. I'm pretty sure it's close, however, since the chart shows 2010 production at 2.7 million bbl/d which is about right. From this chart, note that bitumen production exceeded conventional for the first time in 2009, when it reached 1.33 million barrels per day and conventional slid to 1.22 million. If oil comes from dinosaurs, why don't they drill in dinosaur provincial park? Nobody cares about a bunch of old fake skeletons anyways.